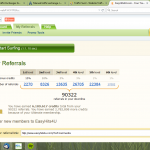 6,189,617 credits earned from 90322 referrals, from 1 Traffic Exchange. The power and potential of Your TE Hoopla! 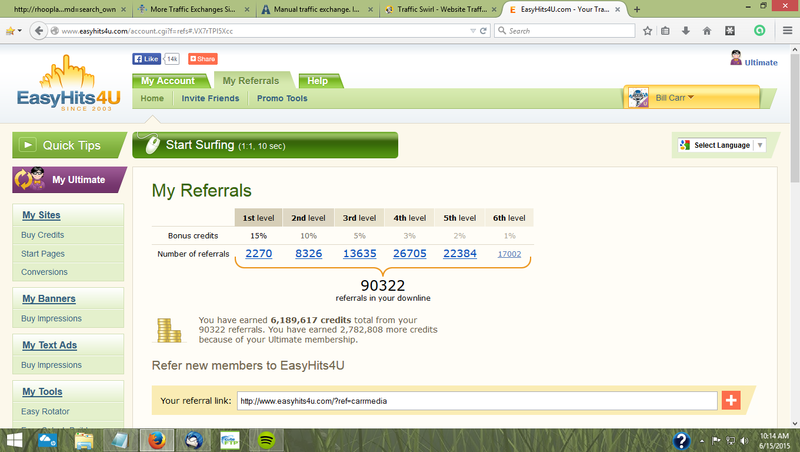 What better vision than to reveal our account with EasyHits4u, a top ranked traffic exchange (see Your TE Hoopla!). But first, you must understand the Vision of Your TE Hoopla! Big Idea: Free traffic builder that helps anyone. Instructions: Join each Top Ranked, update with those referral IDs, and use each to promote Your Hoopla to get signups and earn referral rewards. Why Do this? To build ongoing daily traffic. Yes, this is our account, and we are just ordinary simple people, working class people, who entered online with nothing. We entered with Zero more than 15-years ago. 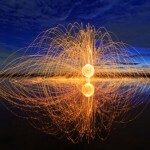 No knowledge, No understanding, No Experience, nothing, as in nothing! Because of nothing, we started the free route, rolled up our sleeves, surfed the traffic exchanges daily, everyday, 3 to 6 hours a day, and here are our results. Oh, but this is just 1 Traffic Exchange. We have done similar in all the Top Ranked, and what a Bountiful Harvest it is. But there is nothing special about us. Yes, we are just ordinary simple people. You can do the same. We can help you. Start today. Step by Step, Day by Day, follow and do. Surf the traffic exchanges, promote Your TE Hoopla! and get signups. 1 turns into 2 and 3 and Thousands. It will multiply and multiply and multiply into an entire army of people working for you. Results? Large Amounts of Ongoing Daily Traffic that may be directed to any site anytime. In our first year, we generated up to and more than 10K ongoing daily hits. After two years, we were working with more than 20K ongoing daily hits. More? When you can, upgrade, starting with your TE Hoopla! and then Top Ranked first. Upgrades increase everything, traffic and commissions earnings. Help? We love helping, simply ask for it. More Help? If promoting any other affiliate program, may we suggest a daily traffic package. This greatly helps you then focus on Your TE Hoopla! and traffic building.